When Ramen Jinya opened in 2011, I was happy that I had an alternative to trekking out to the West End to get a good bowl of Ramen. • Originating from Hakata district of Fukuoka city in Kyushu. 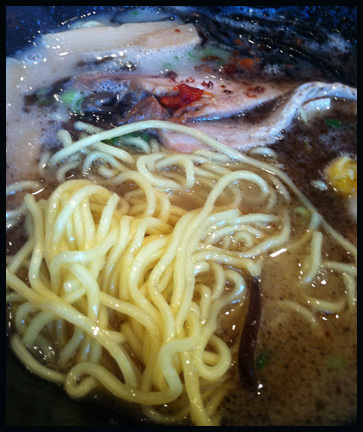 • It has a rich, milky, pork-bone Tonkotsu broth and rather thin, non-curly and resilient noodles. • Often, distinctive toppings such as crushed garlic, pickled ginger, sesame seeds, and spicy pickled mustard greens (karashi takana) are left on tables for customers to serve themselves. • Recent trends have made Hakata ramen one of the most popular types in Japan, and several chain restaurants specializing in Hakata ramen can be found all over the country. However, after trying several of their offerings I grew disenchanted. The bowls of noodles were very made with care with high quality ingredients and a very flavourful soup. In fact, I often recommend it to my friends especially if they are looking for a cheap and tasty meal before a concert or Canucks game. So what’s my issue? I can’t seem to finish a bowl of Jinya Ramen, regardless of type and what I can consume seems to sit in my stomach like a rock for a few hours after. The first time I left noodles & soup remaining in my bowl, my friends thought I was coming down with a cold or something. I normally can slurp every bit of food out my bowls at every other ramen shop (Santouka, Kintaro’s, Motmochi etc) in the city but not at Jinya. I can’t seem to place my finger on why. The amount of food served is about the same as the other ramen purveyors. The only thing I can think of is the soup Jinya uses is a lot heavier and complex tasting than any other I have tasted in the city. After attending a recent Canucks game, my friend suggested I give Jinya another go and specifically their Black Tonkotsu ramen. Some time has elapse since my last visit to Jinya and my friend noted that they had added new items to their menu. On a rainy weekday afternoon, aka the perfect weather for noodles in soup, I sat down at the communal table at Jinya and awaited my friend’s recommendation, Black Tonkotsu Ramen, to arrive. The first remarkable feature about this dish is the aroma. The reason it’s called black Tonkostsu is black garlic oil that is drizzled on top and sits on top of the soup like an oil spill. You can’t mistake its fragrance and taste as it coats the first strands of ramen you eat. In fact all you can taste for the first few bites is concentrated roasted garlic. If Jinya bottled the stuff to sell, I would be the first to line up to buy it. The toppings included a nicely prepared medium sweet soy marinated egg and pork belly with alternating layer fat and tender seasoned meat (an upgrade from the meat served with the basic noodles options on the menu). In addition there are bamboo piths, julienned cloud ear fungus, 2 sheets of nori and crispy fried shallots. This visit did confirm my suspicions – the soup Jinya prepares is the heaviest Tonkotsu broth I have sampled. There was a slight gamey/gelatinous flavour to the soup. The soup’s complexity makes me believe that there are other components to this soup. It reminds me of my dad’s slow cooked lotus root, black eye pea, pork shank and dried oyster soup. It’s bold and leaves a lingering mark on your palate. Thanks to the powerful garlic oil, I managed to finish all my noodles and toppings, which is a huge personal improvement. In addition I didn’t get that leaden feeling after my lunch. 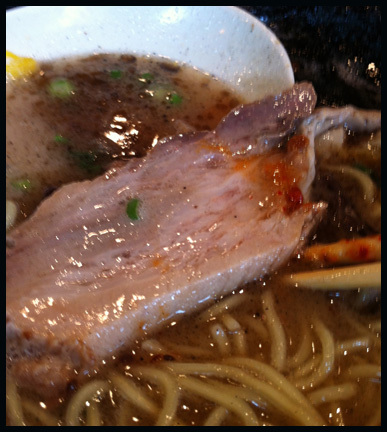 I think Ramen Jinya will never be a “slurp to the last drop” type of place for me. Jinya’s strong flavoured soup may not be my cup of tea, but it definitely would appeal to others. 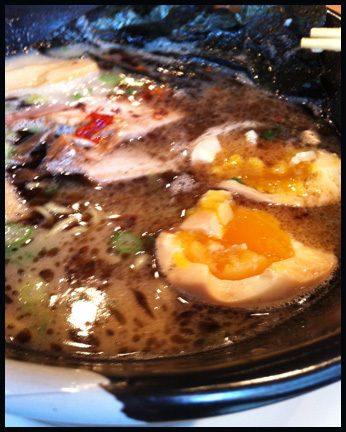 Despite the soup, Jinya’s Black Tonkotsu Ramen is an ensemble of quality and well execution ingredients. I’m glad that I have something to look forward next I need a quick meal before a concert or Canucks game.